Lovers of Aether is a psychological anime horror game developed by Dan Fornace. It is a wholesome animal dating simulator set in the world of Rivals of Aether. Spend your school day talking to the students at Aether High. All the original characters from Rivals of Aether are in attendance. It’s up to you to decide who you would like to take the the homecoming dance. Get to know each character by talking to them and asking questions. But the school day is not all about lollygagging. You’ll have to attend classes, take a pop quiz, give a book presentation and play a game in the computer lab. Every character is some kind of animal. That is an important feature for a dating game. 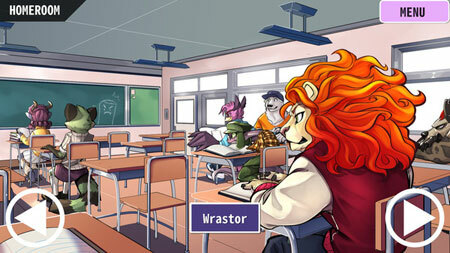 You can talk to characters at your own leisure and enjoy the elaborate lore of Aether High. Sylvanos will help you get ripped. Follow his natural path and you too can obtain beautiful longtoids. If you get stuck in the game, check out the video walkthrough and gameplay for the game. This entry was posted in PC Games, Walkthrough and tagged Lovers of Aether Cheats, Lovers of Aether Gameplay, Lovers of Aether Guide, Lovers of Aether Strategy, Lovers of Aether Walkthrough by Marvin. Bookmark the permalink.